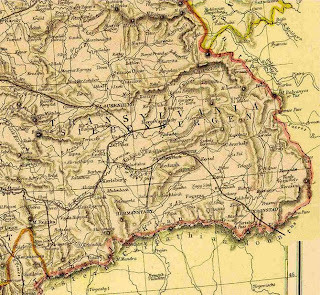 A map of Transylvania, in Romania and in Hungary... through its long history. These are some of the maps I've found over the years, and that I thought are really interesting. It gives a bit of history to Transylvania. Before it was a part of Romania, it was a part of another land- an Empire to be exact. 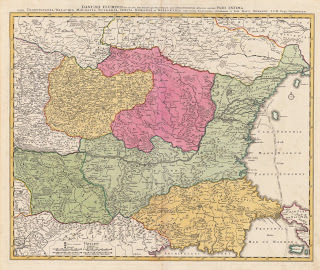 Transylvania in the Kingdom of Hungary, which itself was a part of the Austrian Empire. This is a neat map since it shows the name in both German and the name we know it as. This is of course important to historians since it shows that there is a different culture of people who live there. These include: Hungarian, Romanians, Germans and many others. Another map this time showing the outline of the main principalities of Romania- those of Wallachia and Moldavia. Wallachian was the principality which would bring the most infamous warlord to Transylvania- Vlad Tepes- would would be immortalized as Count Dracula in the novel by Bram Stoker. This map is an older map but it has some great details. It shows the kingdom of Hungary and part of the Balkans in great detail. 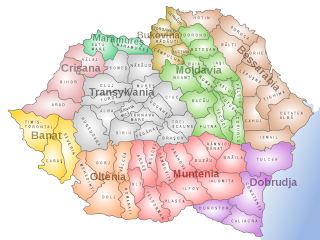 This would be an ever changing area, and up to 1919, Transylvania would be a part of of the Kingdom of Hungary, and the Austrian Empire. After the end of World War, One this is how Romania looked, (see the map on the right) on the left of this map you can see Transylvania. Surrounding it are the smaller areas of the Banat, and Crisana. Some people will say they are a part of Transylvania, but they aren't they are as unique and interesting culturally as Transylvania, although in many places, they are considered a part of the "larger" Transylvania. Both of these places are culturally different from Transylvania, but are as important to the area as Transylvania. it is important to note that Transylvania would not have been a part of Romania except for one Queen of Romania. Marie would transform her country.